Entering its 15th season, Bodiography Contemporary Ballet, like many dance companies, has experienced a number of changes during its lifespan — changes in dancers, repertory and, to a certain extent, vision. One constant, however, has been the affable and Energizer Bunny-like presence of founder/artistic director Maria Caruso. The face, heart and soul of Bodiography, Caruso has for much of the company’s history been its foremost dancer, chief choreographer and vocal leader. Caruso retired as a company dancer last season but remains in those other roles, moving Bodiography ever forward. She recently added to the organization BCB3, a troupe of former Bodiography dancers, and BCB Charlotte, a North Carolina branch of Bodiography. To celebrate the company’s crystal anniversary, Bodiography presents its 15th Anniversary Red Carpet Performance, Jan. 21 at Downtown’s Byham Theater. The program of new, repertory and commissioned works, all choreographed by Caruso, begins with three new short works. 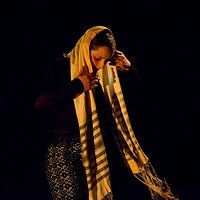 One is performed by Bodiography’s student troupe, one is a work for BCB3, and the third is a duet for two of Caruso’s dancers at La Roche College, where she directs the dance department. Beyond that, Caruso says that she let her dancers choose the bulk of the works on this program from among the 80-plus pieces she has choreographed. The oldest chosen, 2005’s “Solace,” is a 30-minute piece in three movements set to music by Arvo Pärt that will be played live by The Pittsburgh Festival Orchestra. It was inspired by a traumatic car crash involving Caruso’s mother, and the love and support she and her family received afterward. Originally created for the student dance troupe at Winthrop University, “Life Tides” (2015) explores the idea that life began in water. 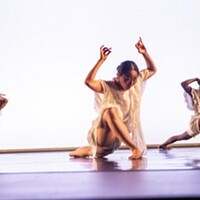 Set to music by Brooklyn-based film composer Garth Stevenson, the 10-minute abstract piece uses a large expanse of fabric and flowing skirts to create the sense of a watery landscape the dancers move within. Another work created for another troupe, “Parabola” (2015), was originally staged by Charlotte-based Open Door Studio’s performance ensemble. The eight-minute contemporary ballet set to music by Swedish electronic duo The Knife focuses on spatial patterning. Rounding out the program is Caruso’s latest, “Pathways.” The 16-minute abstract work is set to music by French musician St Germain and explores differing movement routes.